A federal health insurance program covering 52,000 kids in Washington is running out of money as partisan disagreements keep Congress from reauthorizing funding. The Children’s Health Insurance Program, commonly called CHIP, covers children up to age 18 in low-income families who earn too much to qualify for Medicaid, but can’t afford other coverage. In Washington, the state program for both Medicaid and CHIP is called Apple Health, and the coverage is identical. The only difference is a small premium CHIP families pay: $20 or $30 per child, depending on income level, with a maximum of two premiums per family. April Neuroth, who lives in Deer Park, said the program has been a lifesaver for her family. 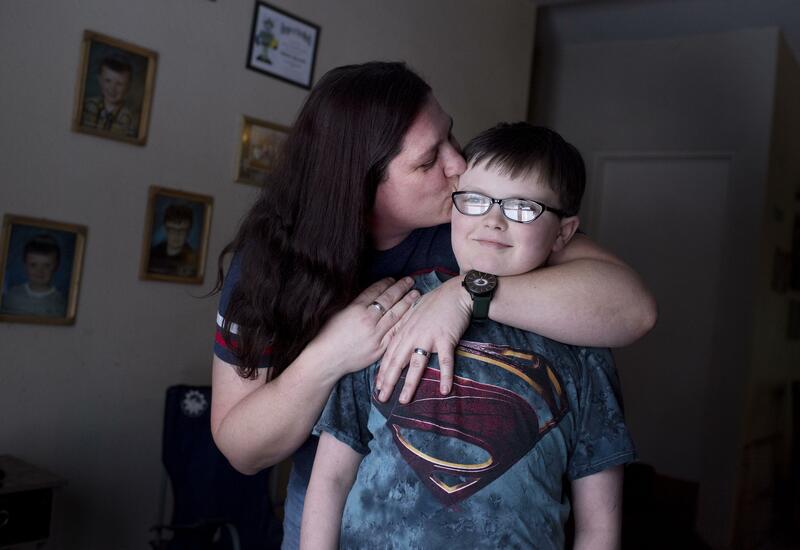 Her 9-year-old son, Nathen, has been covered on it for about three years after the family’s income went up slightly, making them ineligible for Medicaid. Nathen has chronic abdominal issues that caused him to miss a lot of school when he was younger. He’d been sick for three or four years, with good months and bad months. Neuroth said his condition is better-managed now, in part because she was able to get endoscopies and other specialty care to help Nathen get better. He had his tonsils removed with no cost to the family. “If it wasn’t for the program I don’t think we would have actually been able to afford to see a specialist,” she said. They make about $55,000 a year total between her husband’s trucker income and her part-time work at a McDonald’s restaurant. “We keep a real tight budget just so we don’t overspend,” she said. Most months, everything works out, but paying three full-cost health insurance premiums would be more than they can afford. CHIP was created in 1997 and has enjoyed bipartisan support since, with the federal government spending about $14 billion a year on the program. But federal funding expired Sept. 30, and since then, Democrats and Republicans have yet to agree on funding going forward. The House passed a bill on Nov. 3 to fund CHIP for five years, which also raised Medicare premiums on people making $500,000 or more a year, cut funds from the Affordable Care Act’s public health fund, and shortened the grace period for people who fail to pay their share of individual health insurance premiums. U.S. Rep. Cathy McMorris Rodgers, R-Spokane, voted and advocated for the bill, which also funds teaching health centers. All but 15 Democrats voted against the measure, saying Republicans were using the renewal of a program with bipartisan support as a way to undermine the Affordable Care Act. The Senate considered a bill that would renew CHIP funding for five years without other provisions, but it failed to make it to the full Senate for a vote. Kerry Arndt, a spokeswoman for Sen. Patty Murray, D-Wash., said the Senator would not support the House bill. “Republicans shouldn’t hold up children’s health care in order to push through their partisan agenda,” she said in an email. Jared Powell, a spokesman for McMorris Rodgers, put the blame on Democrats. “Unfortunately, it’s the Democrats who are obstructing reauthorization of this critical program for children across our country. The Congresswoman wants to ensure the program is paid for in a fiscally responsible manner, which is where the House bill differs from the Senate’s,” Powell said in an email. He said if the Senate did pass a bill to reauthorize CHIP, McMorris Rodgers would evaluate it before deciding how she’d vote. As Congress fails to act, Washington is watching its reserves dwindle. Mary Wood, the director for the state’s program, said federal government funds for CHIP are about $242 billion a year, a total of 88 percent of the program cost. The state pays the rest out of the genderal fund. Since funding expired, Washington has gotten temporary federal funding of $10.3 million a month to offset some CHIP costs, but can’t continue running the program indefinitely at a deficit. Some states have sent out letters to families using CHIP warning them they may need to look into coverage elsewhere. Wood said Washington might consider taking action in the new year, but she’s confident Congress will renew the program. She said the health care authority, which runs CHIP and Medicaid, hasn’t heard much from families who are worried. But that may be because they don’t realize they’re enrolled in CHIP, since the state program has a different name. “Most families that are on the CHIP program think about themselves as receiving Apple Health with a premium,” she said. About 4,100 Spokane County kids are covered by CHIP this year. Neuroth said losing CHIP would hurt working class families like hers, especially if they have children with chronic health conditions. “I know I’m not the only one that has struggled with a child’s health,” she said. She and her husband have slept easier knowing Nathen is covered, even if they can’t afford health care for themselves. Published: Dec. 24, 2017, 6 a.m.